This adorable little octopus love to gobble up litter and encourages children to keep the land and sea pollution free. 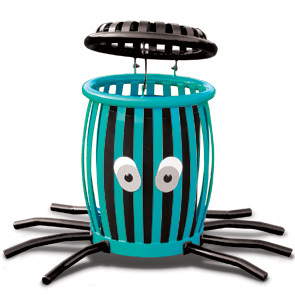 Perfect for parks, zoos, aquariums or any fun outdoor environment, the friendly creature makes proper waste disposal fun for all ages while adding an amusing element of surprise. Colors are as shown. Composed with ribbed steel slats, this high quality commercial grade receptacle will last for years to come. The removable black 34 gallon liner is accessible through the hinged lid, and the octopus receptacle is portable and can also be surface mounted for permanent installment.